This is a review of the supplement Focus Max Two. The manufacturer of this product claims that it can increase alertness. This product can also safeguard neural tissues and the brain against oxidative destruction as users continue to mature. You will learn more about this product as you read further. Extracts of Ginkgo biloba– has robust anti-oxidant capabilities. It plays a major roles in reducing free-radical destruction. Methylcobalamin or vitamin B12- works immediately after absorption making it a more suitable ingredient than other vitamins. Lecithin- resembles fat. It is a source of choline and inositol. Phosphatidylserine- increases the levels of dopamine and acetylcholine, which are key neurotransmitters. It is recommended that users should take 2 capsules during meals or according to the directions of a medical practitioner. A bottle of this product consists of 60 capsules meaning that it will last for 30 days for a single user. Pregnant women and those who are nursing should consult a health care professional before using this product. The same applies to persons using blood thinning medicine and those under treatment for any health condition. A single bottle with 60 capsules costs $40.27 on Amazon. This is a reasonable price given that the product can last for a month for a single user. New users are unlikely to raise quality concerns based on the price of the product. There is no price tag for this price on the manufacturer’s website and it is not clear whether the manufacturer can offer the product at a discounted price. We did not find any money-back guarantee at the time of this review. The absence of a satisfaction guarantee can raise questions as new users may want to know what happens if the product fails to meet their expectations. Furthermore, there is only one review and two comments on the review on Amazon. Although the only available review is positive, new users may want to see more reviews and substantial evidence to prove that this product is able to accomplish its purpose as claimed by the manufacturer. This product is ideal for persons who want to increase their alertness and protect neural tissues and the brain against oxidative damage as they continue to age. One of the benefits of this product is that it combines several trusted ingredients that increase the trust of users. These ingredients are suitable for vegetarians. Moreover, the manufacturing facility is GMP certified meaning that it is a quality product. However, users might raise questions about the quality of this product because the manufacturer does not provide a satisfaction guarantee. Furthermore, new consumers don’t know about the possible side effects, because the manufacturer has not detailed them. 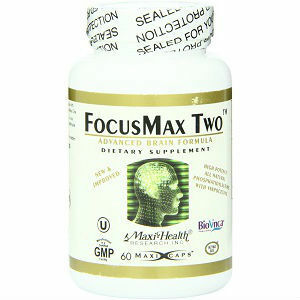 Henry Costa	reviewed Maxi-Health Focus Max Two	on June 14th	 and gave it a rating of 2.5.